Two-stage ditches widen the conventional channelized drainage ditch and include a floodplain bench. The floodplain bench provides floodplain storage and is vegetated which encourages nutrient removal. 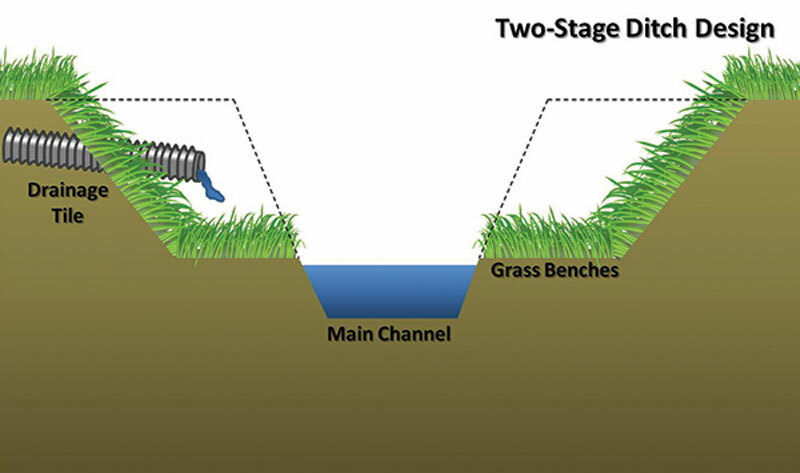 Two stage ditches work in historically channelized drainage ditches. The modified ditches maintains drainage while reducing nutrient export and providing flood storage. 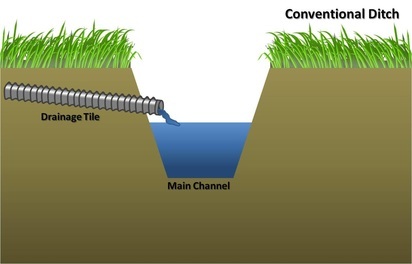 Two-stage ditches are wider than conventional drainage ditches. No ground is usually taken out of production as most of the two-stage ditches are located in streams with an adjoining filter strip. A rule of thumb for two stage ditches is that their top width is approximately 3x as wide as a conventional ditch. The USDA-ARS has reported a 30% higher denitrification rate along the constructed floodplain benches compared to naturalized channels. Perhaps the biggest benefit of two-stage ditches would be additional storage to handle flood events. The added channel width allows up to a 200 year flood to be stored within the banks. Two-stage ditches are eligible for financial assistance through the NRCS EQIP Conservation Practice Standard 582 Open Channel in select states. Your state may also have state or private funding available. For more information, please refer to the ADMC Financial Assistance page.